Description: An eastbound approaches the Canal bridge at Schuyler, NY. 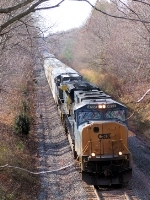 Title: CSX 488 EB on the #1 Track. Can you guess the MP #??? Description: The pusher on a U156 coal train passes over a bridge still lettered ACL on the Spartanburg Sub. This bridge over US221 is REALLY difficult to photograph due to vegetation growing on power lines alongside it. Description: CSX Q137-07 is about to cut the two new CPLs' which haven't been activated yet with a mostly empty intermodal train. Note: The old signal is still standing beside the new signal. Description: A silent helper set sits across from the decaying station and a short distance from the vine encrusted coaling tower at Ronceverte, West Virginia. Description: A silent helper set sits across from the decaying station at Ronceverte, West Virginia. Description: A rare occurance in progress, as a pair of units standby to attach to an eastbound coal train in Alderson. Normally, helpers are attached well east of here, in the Ronceverte yard. Description: CSXT 488 leads Q327-09 west on the straightaway between East Lansing and Lansing, approaching the bridge at Aurelius Road. Description: SD70AC 4722 leads Q300 eastbound at CP River on a bright morning. Description: North Greenwood Ave. bridge, Hopewell Borough, 1250 hours.